It’s probably the most important image on your computer, so do it justice… Here is the very tiny and powerful tool to take your simple desktop wallpaper to the next level! So, we’ve gathered you up a free tool that can automate the whole process of fetching and decorating your desktop with latest online photos from Flickr. 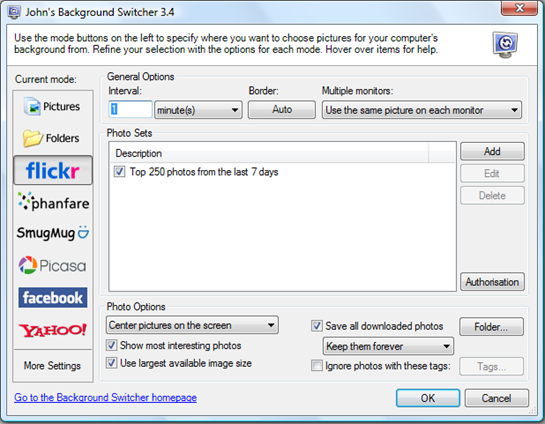 Settings can be for just about every time setting you can think of.You can pick where you want to choose photos from using the buttons on the left side buttons of the settings window.The tray icon also lets you to pause switching, view all downloaded photos. Your background can show one image, four images in a 2×2 grid, or hundreds of thumbnails at once. Images can change after a specified number of minutes, hours or days, or even at a specific time of day. And if you have multiple monitors, it can show different images on each display. I think the screen saver can be the more important image but that’s just me.